It’s full of caribou – and we don’t mean the animal. Caribou at Carnival means the booze – a sweet but potent blend of red wine or port, brandy, vodka, and sometimes local maple syrup – that wards off the chill and almost guarantees a rollicking good time. The name comes from the original recipe, which, according to legend, combined brandy with caribou blood. Don’t worry, the spirit has evolved since then, but if you down enough of the stuff, you might not even know the difference. It's also commonly served in a long plastic cane, for even more drinking pleasure. Bonhomme, Carnaval’s big, mischievous ambassador, is a serious celebrity in Canada. Don't even think about calling this 400-pound, hat-and-sash-wearing, snowman fellow a mascot; he enjoys A-list status at Carnival. Bonhomme, which means “good man” in French, is beloved by families and frat guys alike. He’s bilingual of course (French and English), fun-loving (always ready to get into a snowball fight), and sometimes downright frisky, posing with the occasional scantily clad snow bunny with the panache of a Hollywood heartthrob. He's also the inspiration for the carnival entrance pass, known as the effigy, which is a plastic figurine of his likeness. No surprise, then, that his uncovered ear is so big – all the better to hear the nonstop chorus of props and cheers. That arrowhead sash everyone wears is more than a fashion statement. Worn by many Carnival partygoers and an integral part of Bonhomme’s outfit, the sash is a tribute to Amerindian culture and has remained a symbol among Quebécois, especially during Carnival. In the early 19th century, the belt served as further buffer against the cold, tying jackets at the waist to prevent the chill from creeping in, and also provided support to the kidneys during physical activity. 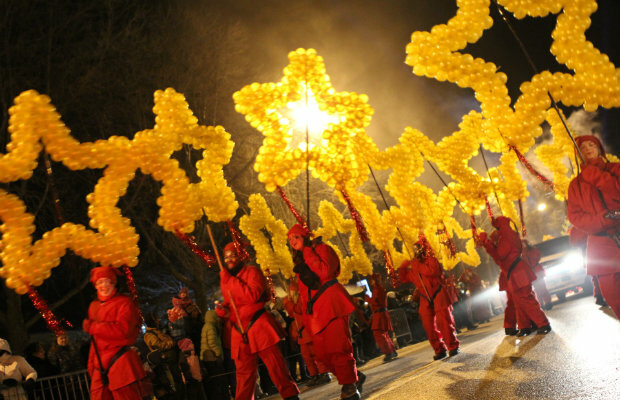 Today, the tradition lives on during Carnival – even if your physical activity is limited to throwing snowballs and lifting your glasses of Caribou. A goal for 2014’s event: Host the world’s largest snowball fight. Aiming to one-up Seattle, which made the Guinness Book of World Records for the largest snowball fight last year with 5,834 attendees, this year’s Carnival will attempt to gather about 6,000 hardy souls on February 1 to blast each other with snowballs. And we do mean blast: Helmets and eyewear are required for participation. For serious bragging rights, you can bed down in an ice hotel. 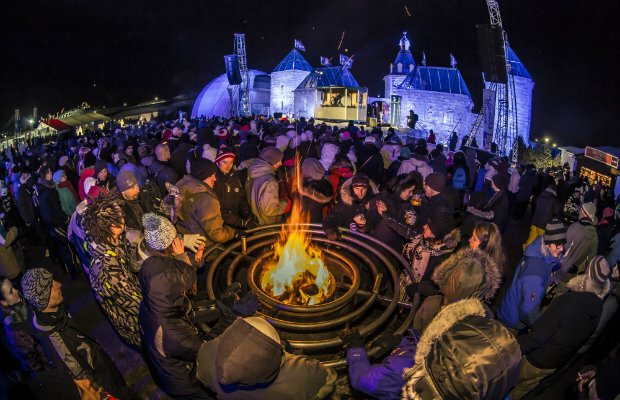 The Hotel de Glace, or Ice Hotel, located a few minutes outside Quebéc City, is a fitting (and freezing) complement to all the action of the festival. Opened in early January, this 36-room hotel lasts until it melts, usually by late March, with all walls, floors, and furniture constructed from huge blocks of ice. There’s also an ice bar and even a chapel, where the occasional (and brave) bride and groom can say their vows through chattering teeth.